With a gallery opening, an exhibition, the jazz festival, eating out and the theater it was a busy weekend. Like almost everywhere things are quiet and then it seems everything happens at once. This past weekend in Casco was one of those busy sessions. We got started Saturday afternoon by doing a mini gallery crawl. 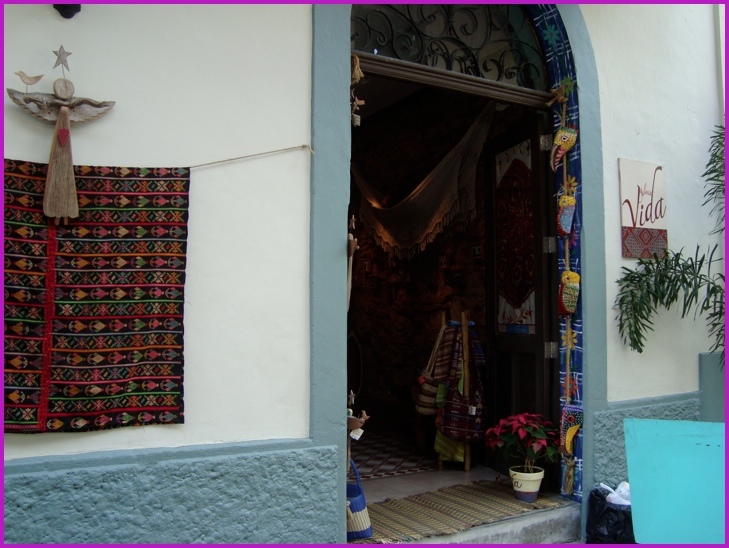 I would guess that we have at least a dozen galleries in the neighborhood, ranging from the required tourist souvenir places to those that showcase original works only (high priced). 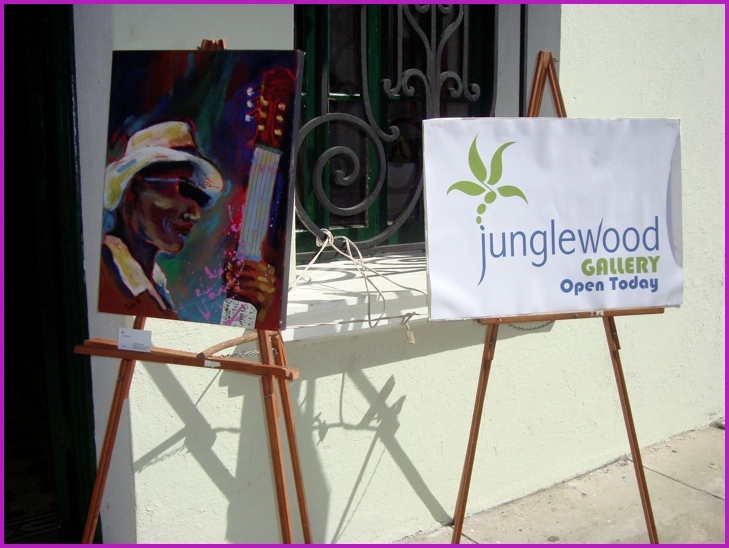 One of our favorites, Galleria Vida (prior home of our angel), was hosting an exhibition by an artist visiting from Key West. 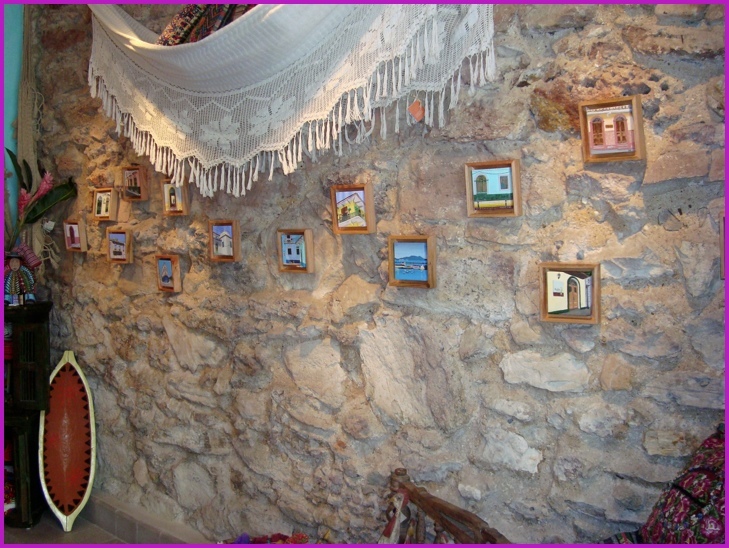 These miniature paintings of scenes around Casco Viejo were very nice - looks like a couple will find their way onto our walls along with another angel. Next stop was a new gallery that was having its grand opening. Junglewood Gallery had paintings (little above our price range) and a private collection of driftwood carvings that were very unique. 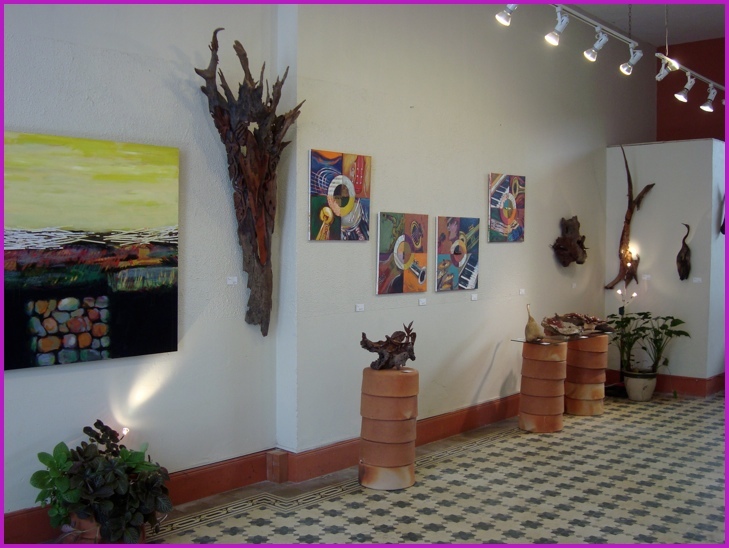 This gallery is in a restored building that is the headquarters of Earth Train, a NGO operating in Panama. 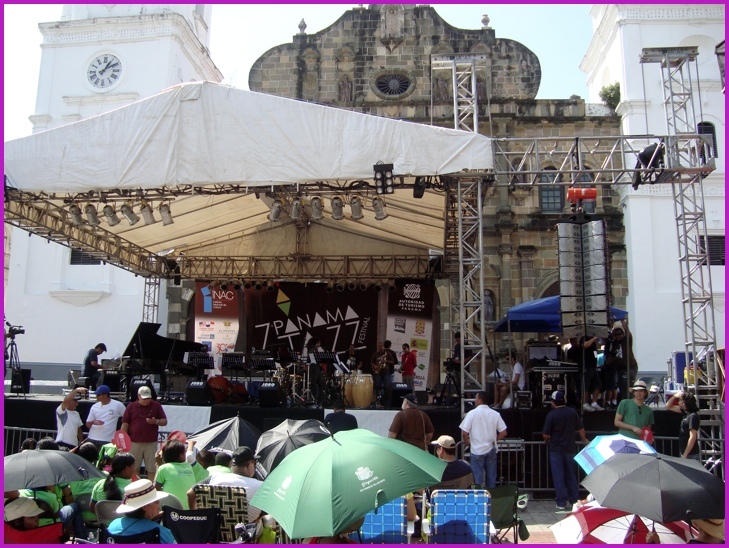 Later on Saturday the closing concert of Panama's 7th International Jazz Festival got underway at Cathedral Plaza. 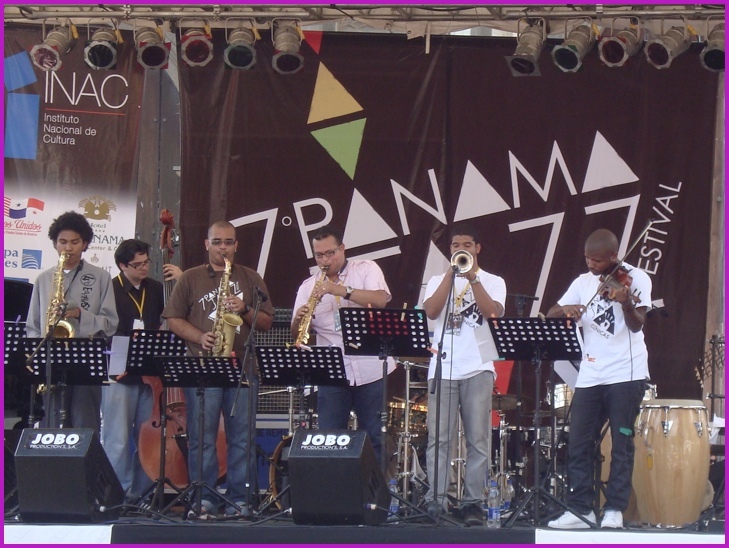 The festival was founded by Danilo Pérez, a Panamanian and director of the Berklee College of Music's Global Jazz Institute in Boston. Just another example of unusual connections that are commonplace in Panama. This free concert attracted a lot of people - the biggest crowd I've seen for any event in Casco Viejo since we've been here. I wandered around (Jane is not a big jazz fan) listened for a while then back to the apartment for a rest, then back out in the evening, when it was really enjoyable. Everyone seemed to be having a great time. Sunday afternoon we walked across the street to the National Theater. Insert loooooong pause here while you guess what we were about to see - actually we were also wondering, but hey, sometimes you just need to take a chance. A little before five (not bad for a performance that was scheduled for 4:30) we heard guitars and the sound of tap dancing (didn't guess that, did you) as Tap Olé took the stage. Think mini mini Riverdance with a Spanish flair. 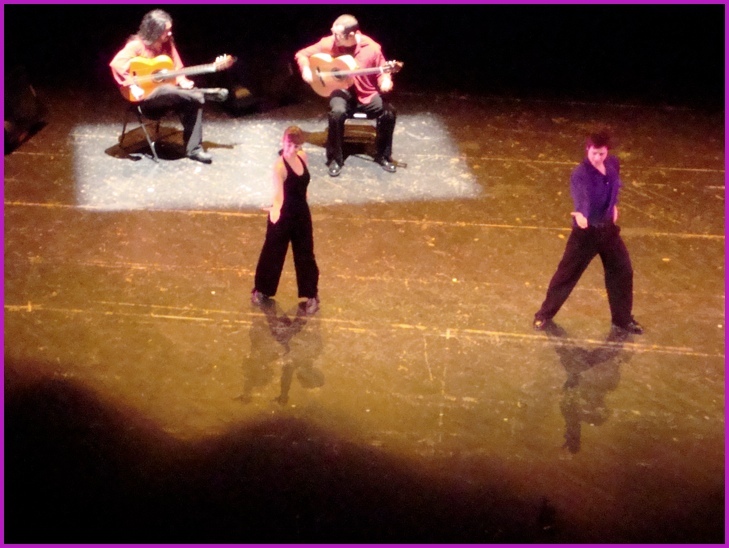 Four people total, two outstanding guitar players and two fantastic dancers. We watched a little over an hour of non-stop action and great music — one of the best shows I've seen anywhere! 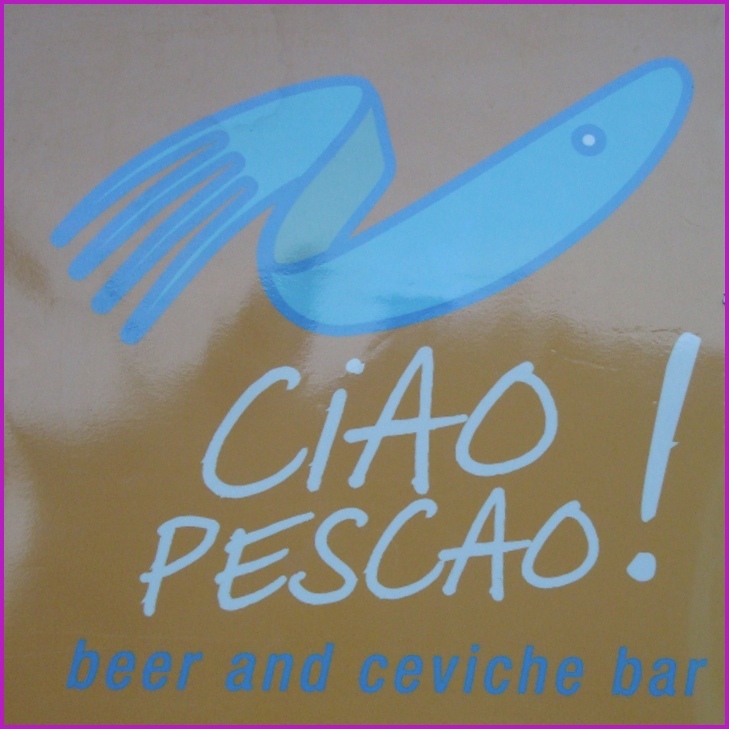 After the show we walked a few feet to Plaza Bolivar for dinner at Ciao Pescao - our neighborhood beer and ceviche bar. They do ceviche with a flair, I had the Sicilian version. 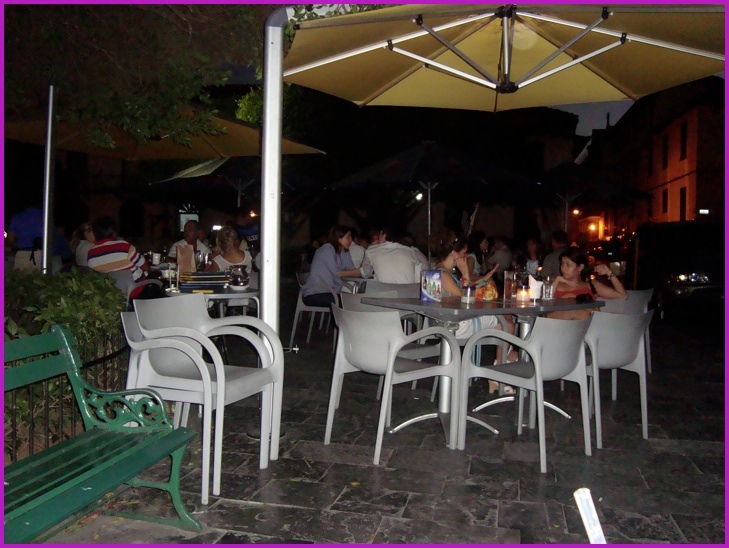 Good food, cold beer and a cool evening at a sidewalk cafe - nice way to end a busy weekend.